Looking for a Used Outlander in your area? CarGurus has 13,013 nationwide Outlander listings starting at $1,995. Mitsubishi’s 7-passenger Outlander offers a solid choice for the frugal family, with a well-appointed cabin boasting features not often found in this price range. But its bland driving dynamics and choice of two comparatively tepid drivetrains won’t have people lining up for blocks to buy this midsize crossover. With the introduction of its new plug-in hybrid Outlander PHEV, Mitsubishi hopes to attract a more fuel-conscious and eco-minded crowd. The Outlander, now in its third generation since its 2003 debut, is offered in four regularly powered trims: the ES, SE, SEL, and GT. The debut of the Outlander PHEV is delayed until summer 2017 for some necessary tweaks to the battery pack and to add extra creature comforts to match the regular Outlander SEL trim. The Outlander comes with 3 rows of seating, but the third row accommodates children or small adults only semi-comfortably. However, the second row slides and reclines for added comfort and easier access to the third-row seats. Total cargo capacity is 63.3 cubic feet, with 10.3 behind the third row and 34.2 behind the second row. New standard and optional features for the 2017 Outlander include an upgraded cabin with a gloss-black center console, a 12-volt cargo-bay outlet, a shark-fin antenna, and front courtesy floor lights. A new Smartphone Link Display with Apple CarPlay and Android Auto, a heated steering wheel, and an electronic parking brake are standard on higher trims. The ES trim is also now available with an entry-level All-Wheel-Control (AWC) full-time all-wheel-drive (AWD) system. This feature boasts an electronically locking center differential and automatically vectors torque and braking among all 4 wheels for best traction. Despite impressively responsive steering, however, this Mitsubishi crossover doesn’t match most rivals in overall handling or ride comfort, and the S-AWC system is made for maneuvering in deep snow and sand, not serious off-road adventures. The Outlander ES, SE, and SEL come with a 2.4-liter inline 4-cylinder powerplant that combines with a continuously variable transmission to put out 166 hp and 162 lb-ft of torque. 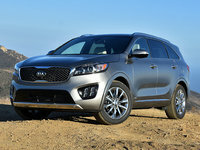 Maximum towing weight with this engine is 1,500 pounds, and fuel-economy ratings are 25 mpg city, 31 highway, and 27 combined with front-wheel drive (FWD). The SE and SEL trims carrying available AWD boosted by Super All-Wheel Control (S-AWC) with enhanced torque and brake vectoring each get 24, 29, and 26. Look for a 0-to-60 time of 9.2 seconds from the Outlander with AWD, which is a bit slower than most rivals packing similar drivetrains. For 2017, the Outlander GT carries a 3.0-liter V6 engine paired with a 6-speed shiftable automatic transmission to throw down 224 hp and 215 lb-ft of torque. The GT, which comes with standard AWD, boasts 3,500 pounds of towing capacity and can reach 60 in 7.6 seconds, about average for its class. Mileage is expected to match the current 20 mpg city, 27 highway, and 23 combined. The 2017 Outlander PHEV is slated to tote a 2.0-liter inline 4-cylinder hybrid engine complemented by two 80-hp (60-kilowatt) electric-drive motors, one in front and one in the rear. The PHEV is designed for full-time all-electric driving, with the 12kWh lithium-ion battery capable of being recharged from either a plug-in receptacle or by the powerplant. Touted to have a range of about 30 miles on a charge, the plug-in hybrid will come with S-AWC and 3 driving modes: the fully electric Pure EV mode; Series Hybrid, which charges the battery while driving; and Parallel Hybrid, where the engine and electric motors both power the vehicle. And, with its drive system protected by unique lower shielding, the Outlander PHEV can even be driven (slowly) through shallow streams. Look for the 2017 Outlander to come standard with uncommonly upscale features like automatic climate control, a reversing camera, a 6.1-inch color touchscreen, and a 6-speaker, 140-watt audio system with satellite radio. Other niceties like leather upholstery, heated front seats, and a remote garage door opener are standard on higher trims. Optional equipment carried over from 2016 includes a towing package, a power sunroof, and a Rockford-Fosgate premium entertainment package. The Outlander sports safety-feature upgrades like enhanced blind-spot warnings with lane-keeping assistance and rear cross-traffic alerts, forward-collision mitigation braking (now with pedestrian detection), a wiper de-icer on all 4WD versions, and automatic high-beam headlights. There’s also an optional new multi-view camera system helpful in challenging parking conditions. Standard safety equipment that carries over includes 4-wheel antilock brakes (ABS), front side-mounted airbags, 3-row head curtain airbags, traction and stability control, LED positioning lights, and in higher trims, front fog/driving lights and turn-signal-integrated mirrors. Adaptive cruise control is a carryover optional safety feature for 2017. The 2017 Outlander with AWD scored a 5-star overall rating from the National Highway Transportation Safety Administration (NHTSA), while the FWD version gained only 4 stars overall. The Insurance Institute for Highway Safety (IIHS) gave the 2016 Outlander a Top Safety Pick+ rating thanks to its optional forward-collision mitigation system. The 2017 Outlander competes with Nissan’s Rogue and Kia’s Sorento in the 7-to-8-passenger crossover segment, while the Mazda CX-5, Honda CR-V, and Subaru Forester are similarly sized and priced, but offer only 5-passenger seating. 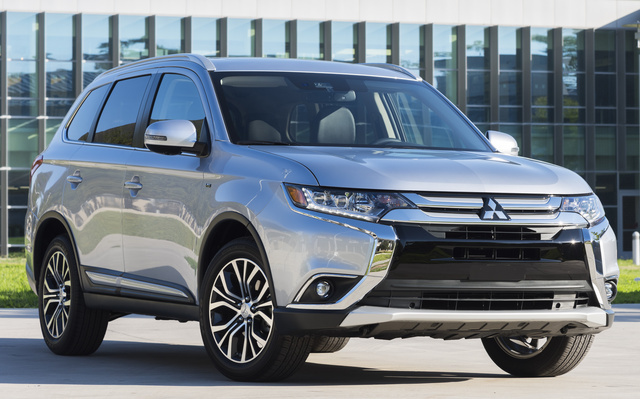 What's your take on the 2017 Mitsubishi Outlander? Have you driven a 2017 Mitsubishi Outlander? Backlighting On The Radio/Nav Display. 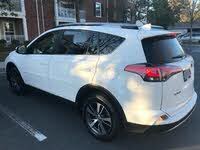 2017 MY18 MitsubishiOutlander Exceed Car Battery Is Flat, Why?